As part of the Booksneeze blogger book review program, I picked a book that I normally won't buy from my favorite book shop. The title of the book is "Living Life in the Zone: A 40-Day Spiritual Game Plan for Men" by Kyle Rote Jr. and Dr. Joe Pettigrew. However, I do have a few good reasons why the title was attractive to me. I love any kind of discipline that takes place for 40 days. It's very Biblical! I am married to a former professional athlete who will appreciate the sports-themed language of the book. I am married to someone who loves God and does full-time ministry to athletes of all ages. I always desire to know the heart of my husband and what concerns him in his walk with God. As turned the few pages of the book, I was very delighted to see how each day is neatly divided into seven sections -- perfect for men who process thoughts and ideas into compartments! And, I am kind of like that too! 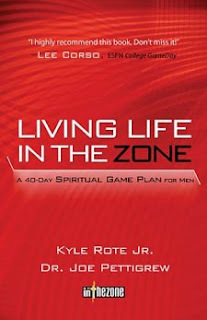 I love that this book is packed with rich, practical lessons that any men will find easy to read. I can give this to a long-time believer or to someone just trying to get to know the Jesus because the topics are timeless. I even enjoyed it so much that I found myself reading through multiple chapters in a day! I also plan to save copies of this book to give as gifts as I am completely certain that it will be well-received.